Let us all pray for the quick and thorough revival of the Orthodox Church in the Russian Federation. In the snowy silence of a Moscow park, a 26-year-old businessman named Aleksandr Pushkov stood naked except for his Speedo, a column of steam rising from his body. His clothes were piled under a tree, and he had just climbed out of a hole in the ice. It was his seventh year taking part in the Epiphany ritual: the trance-like preparation, the electric shock of the water and the 20- or 30-second wait for a feeling he described as “nirvana.” As cross-country skiers picked their way through the woods, Mr. Pushkov stood by himself, barefoot and steaming. The midday sun was just visible above the horizon, as white and remote as a full moon. 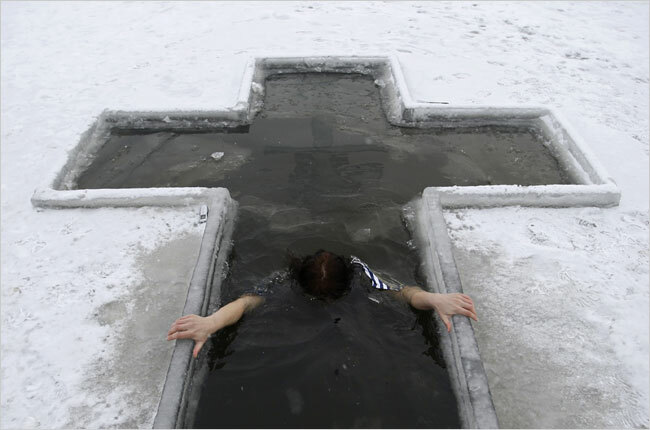 Monday was Russian Orthodox Epiphany, and roughly 30,000 Muscovites lined up to dunk themselves in icy rivers and ponds, city officials said. 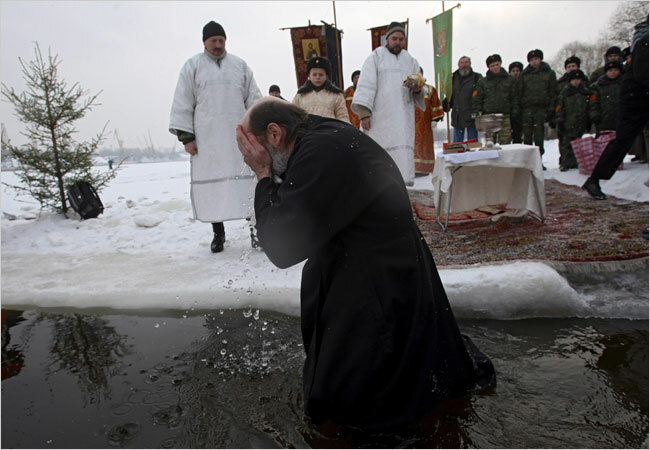 The annual ritual baptism, which is believed to wash away sins, is enjoying a boisterous revival after being banished to villages during the Soviet era. These days, it is a ritual with high production values. Several sites in Moscow were furnished with no-slip carpeting, heated tents and supervisors with megaphones. Politicians have seized on it as a photo opportunity; the theatrical ultranationalist Vladimir V. Zhirinovsky took his plunge this year at Bottomless Lake, a Moscow River tributary, flanked by 15-foot tubes of fluorescent light. “It has become a show — not only that, but a patriotic show,” said Boris F. Dubin, a sociologist with Moscow’s Levada Center. The immersion ritual satisfies a public hunger, he said, for “something that is truly Russian, ancient, real. For what distinguishes us from other people.” Whatever the reason, the crowds have been growing exponentially. A group of celebrants in Tver, on the Volga River, was so large on Monday that the ice collapsed and 30 people plunged into the water. Twenty-four of them required medical attention, and 11 were still hospitalized on Tuesday, said a spokeswoman for the Ministry for Emergency Situations. Foreign media outlets discuss the election of the new Patriarch of the Russian Orthodox Church. Western journalists are not so much interested in the election per se as in the persona of the new patriarch. The foreign press tries to analyze both his previous statements and deeds and forecast his future steps and decisions. Opinions vary from groundless accusations to low-key praise. There is nothing surprising about the fact that the anti-Russian media did not refuse from their typical orientation in the estimations of Russia’s new Patriarch. Some newspapers wrote that Metropolitan Kirill won the title owing to his close relations with the Russian administration: Kirill was often spotted in the company of Vladimir Putin, they wrote. The New York Times said that the battle for the throne of the patriarch was like a political struggle and that Russian glossy magazines provided celebrity-like reports about the candidates. Germany’s Berliner Zeitung wrote that many eparchies sent lay people - state or economic officials to the council of the bishops, which became a reward to those who patronize the Church in Russia’s regions. Ukrainian media said that Metropolitan of Kiev and All Ukraine Vladimir refused to run for the patriarch in spite of the fact that his chances were pretty high. Ukrainian journalists believe that Metropolitan Kirill won the election because Russia was a one-party country. They also fear that the new patriarch will be tougher than his predecessor. Ukrainian observers think for some reason that Kirill may take effort to strengthen Russia’s influence in the countries of the former USSR, Ukraine that is, where most of the churches are affiliated with the Moscow Patriarchy. The British press does not seem to like the Russian Orthodox Church at all. The Times, for example, wrote that all three candidates were KGB agents. The respectable newspaper refers to only one source, which can hardly be considered reliable – dissident priest Gleb Yakunin. The priest supposedly studied KGB archives and discovered that all church leaders had an experience of working at the KGB. A closer look at the articles of the above-mentioned newspaper shows that such negative remarks against the election of the new patriarch are based on Metropolitan Kirill’s criticism of Western values. The church diplomat particularly criticized Western notions of human rights and said that they contradicted to the Orthodox teaching. The Times disapproved Kirill’s election against such a background – what else The Times could do? France’s Le Figaro wrote that the new patriarch was not a liberal figure. He condemns the liberal and secular kind of thinking and advocates the holding of church services in the Old Slavic language, which most of the faithful do not understand, the newspaper wrote. The French journalists also reminded of Kirill’s remarks about the inadmissibility of compromising dialogues with the Christians of other confessions. There is nothing surprising about such reviews of the French press taking into consideration the widespread atheism in France. Western journalists also wrote that the parents of the new patriarch were persecuted for political reasons under Stalin. They hope that Patriarch Kirill will take efforts to root out the legacy of communism at this point. US journalists said that Kirill was prepared to fight the moral decay of the Russian society. They concluded that the new patriarch would do his best to make the Church play a more important role in Russia.